The translation of the Albanian words is ‘Jesus said… WHOEVER COMES TO ME I WILL NEVER TURN AWAY’ John 6:37. 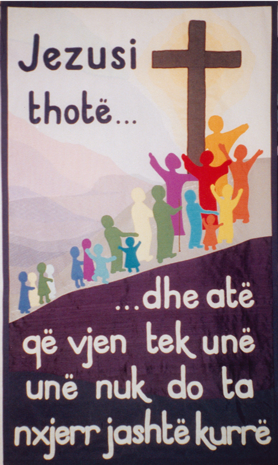 These words of Jesus of unconditional acceptance and welcome are on a banner made for a room set aside as a chapel in Tirana prison. A church pastor in that city was asked to provide some bright welcoming banners for the chapel. Hearing about this request we prayed and tried to imagine what it would be like to be confined to prison. We were aware that many prisoners and visitors would have no previous knowledge of Christianity and its symbols. The pastor gave us the correct translation of the words via email. Our design was influenced by a banner from St John’s Church, Welling, for which we are very grateful. The multi-coloured figures making their way to the cross seem to echo the words, and layers of net were used to highlight the cross and form a misty background.